Meet Kelsey Horton, RN, BSN, DNAP, CRNA. 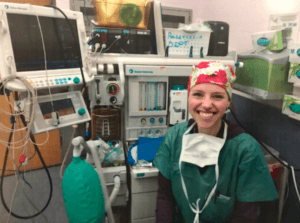 From life as a new medical ICU nurse to her current role as a nurse anesthetist, Kelsey shares her journey. I graduated with my BSN from the University of Kansas in 2012. After graduation, I began working in the medical intensive care unit (MICU) at the University of Kansas Hospital. I spent two years as nurse in the ICU before going back to school for nurse anesthesia. My dad is an orthopedic surgeon and my mom is a physical therapist. I always knew I wanted to work in health care like both of them but wasn’t necessarily interested in their fields specifically. I was really interested in the operating room setting in high school and would occasionally spend time watching my dad operate. They always put me in a chair behind the drapes so I wouldn’t be a threat to the sterile field. This is where the CRNAs sit during cases so I often got to chatting with them about what their job entailed. Each one I spoke with discussed their high level of job satisfaction and encouraged me to consider their job path. The rest is history. During your time as a medical ICU nurse, what did your typical day look like? As an ICU nurse you are assigned two patients each shift. I cared for critically ill patients with complex medical disorders including acute respiratory distress syndrome, septic shock, and multi-system organ failure. These patients often required ventilatory support, hemodynamic monitoring, and central venous access. Because they are intubated and sedated, they require full support and care. Some of the duties included turning, bathing, medication administration, ventilatory management, and titration of inotropic and vasopressor medications. What was the most exciting part? There was always a bit of an adrenaline rush when we got a really sick admission on the unit. We would work together as a team between the physicians, nurses, and respiratory therapists to get the job done and get the patient stabilized. I loved using critical thinking skills in a high-stress environment to get patients feeling better than they did when they came to us. Although working in the ICU is very rewarding, it is also very taxing mentally and physically. Day in and day out you care for patients that are battling for their life, possibly at the end of their life, and likely at their sickest point they will ever face. Patients typically require complete care as they are often intubated and sedated. I also spent a great deal of time educating and supporting families during times of great grief. Although there were happy endings and full recoveries, many patients spent their final days on our unit and it never got easier to lose a patient I was caring for. Which courses in nursing school helped you prepare for this role? Pathophysiology was the most helpful in order to understand patients’ disease processes and appropriate management. You made the decision to go into a three-year CRNA program. What motivated you to do this? I had always planned to work in the ICU for a few years as a requirement for CRNA school. I had gained critical thinking skills, more self confidence in my abilities as a nurse, and was ready to take a leap of faith. Although I knew CRNA school would be the most challenging thing I had ever done, I was looking to further my career in a rewarding profession that I could continue for the rest of my working life. Do you feel that your time as a MICU nurse helped you to prepare for life as a CRNA? My time in the MICU did help me develop strong critical thinking and time management skills that are necessary for a CRNA to use daily. As a CRNA, what does your typical day look like? Every day is so different depending on what location in the hospital I’m working in and what type of procedures or surgeries are being performed. Typically when I first get to work, I get my room set up for the day. This includes checking my anesthesia machine and making sure all components are working. I get my airway equipment ready and drugs drawn up that I will be using for the case. Then, I meet my patient and do a preoperative assessment. I take my patient back to the operating room, induce them under anesthesia, and intubate them for the case if necessary. Throughout the procedure I monitor the patient’s vital signs, administer a variety of medications, manage the ventilator, and keep them asleep and happy. When the procedure is finished, I wake the patient up and take them to the recovery room to be cared for by the PACU nurse. That is just a small glimpse of what CRNAs can do. They work in various settings like hospitals, outpatient surgery centers, endoscopy centers, and pain clinics. They are able to practice independently in many states across the country. Aside from anesthesia in the operating room, they can also place regional anesthesia blocks before or after surgery to prevent pain, place central and arterial lines, place labor epidurals and spinals for obstetric patients, and are utilized in EDs and ICUs to intubate patients. Patients are often very nervous or anxious before having major surgery. I love to make a connection with them and gain their trust that I will take excellent care of them while they are under anesthesia. When they wake up pain free, without nausea, and thank me for taking care of them I always feel very accomplished and proud of my profession. Since I’ve only been working as a CRNA for less than a year, I would say the toughest part of my job was honestly the schooling necessary to get here! It is tough to go back to a doctorate program after being in the working world for a few years. The didactic portion of school is long and grueling. From a clinical perspective, we spend many months away from home traveling for clinical rotations. But ultimately, that hard work was so worth the reward of a profession I’m proud to be a part of. I have no regrets! What advice would you give to new nurses just beginning their journey in the working world? As nurses, we are very fortunate to be in a profession with endless job possibilities. Explore many options and find the type of job that best fits you! I would also say be patient. You won’t feel totally confident in yourself of your abilities when you first start working. It takes some time for these things to develop and that is totally normal. Was there anything that you wish you would have known before starting your nursing journey? This is going to sound silly, but I wish someone would have told me to take care of my body! Nursing can be very physically demanding between lifting and moving patients and you spend many hours on your feet. Make sure you invest in some good compression socks, take some time to sit down, use good body ergonomics, and stay hydrated! It sounds like common sense, but you have to make your body a priority if you want to work as a nurse for many years.